seep. v. 1) to pass, flow or ooze gradually through a porous surface. 2) to enter or be introduced at slow pace. 3) to become diffused; permeate.There are two approaches to evangelizing a large group of people. One: reach them all at once. If it's a large group, this is a lot of work, and may be impossible. The other: a movement which grows slowly at first, then all at once--exponentially, unstoppably. Doubling, then doubling again, and then again. (Why doubling is important.) Movements are flashy because at some point they see large numbers. (Usually because they've doubled enough times that the next double is big enough to show up on some blogger or journalist or politician or fundamentalist group's radar.) Movements are important because of their power to sustain themselves, seeping bit by bit into a population. (Large numbers seem important until viewed as a percentage of the population. 10 million in a movement is only 5% of an overall 200 million population.) Movements are important not because of how many times they've doubled - or how fast - but because they can do it again. Consider the difference between a political campaign and Facebook as a rough analogy. In a political campaign, you build toward a specific event - for example, a nominating convention or an election. You work hard, you have fundraising events and public speeches, you buy advertising, you try to get people to vote for your candidate. Each event the candidate is at (like a speech) happens once, and you try to maximize exposure. Each event is once-and-done. Finally, there is the vote. In spite of all the effort, in most elections only a small percentage of the people actually vote--and they can't vote the day after. Once the election is over, it's finished--until the next round, often years later. Facebook, on the other hand, is a viral movement. You can decide to join Facebook today; and if you don't today, you might tomorrow, or the next day. There's no point at which you can't join. It's been around for years. It will be around for years. The same goes for "friending" someone on Facebook--if you see my post today, you might "friend" me so you can follow more posts. But if you don't today, you might tomorrow. There's lots of chances. And the more of my friends join Facebook, the more chances I'll have to join as well - and with each chance, I'll be progressively more likely to say "yes." Politics is flashy because of elections. Facebook is important because the day after the election, people are becoming part of Facebook - and the day after that, and the day after that, and the day after that. 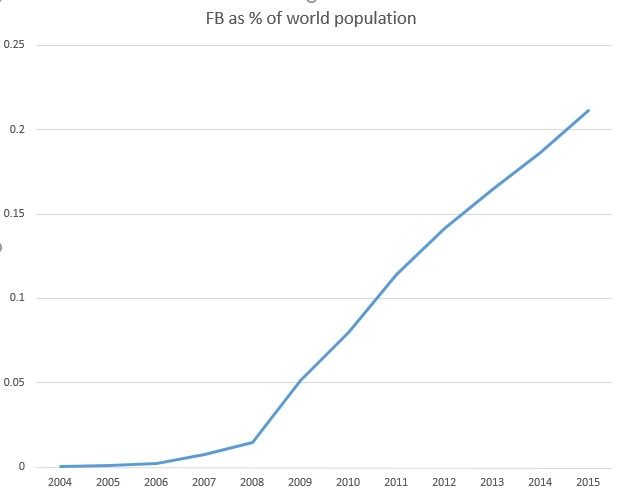 Facebook is important because it is sustained. Generations will "grow up" using it. It has slowly seeped into our society and world--until over a billion people use it, now making up a quarter of our world. We sometimes equate a "movement to Christ" with a quick, rushing, sudden revival in which thousands upon thousands "overnight" become believers. That's the flashiness of an election. But movements we've studied are rarely like that. They are slow to start. They seep. It's not just about how fast people come in, but whether they keep coming in: disciples making disciples who make disciples - as much in sustainability as it is in speed. So, yes, we measure movements by whether they can get to 4 generations in a limited set of time - say, 18 months. This is a measure of speed. But we also measure movements by whether they can do this consistently. If they can't, the movement has stalled or worse, fizzled. Don't worry too much about building for speed (except to not put anything in the way of it). Build for sustainability - make it more and more possible for each disciple to make disciples - and speed will not only take care of itself, but given enough time, the movement will transform the population.